Greece looks to have made it through the weekend, with the center-right and pro-bailout New Democracy party winning the parliamentary election there by a narrow margin over the feared Syriza party. A Syriza win would have put an anti-Euro party into leadership. Greece elected a party that will continue to play ball with the European Central Bank. They will commit to austerity as best they can. However, after all of the Sunday afternoon drama (Happy Father’s Day), nothing really changed. Greece still needs bailout funds to survive and remain solvent, and have no choice but to bow to German terms to get those needed funds. There are still massive problems in Spain and Italy. France will get their mention soon enough as they are moving more toward socialism in the wake of the recent election. This is not going to stop. What does that mean for the grain markets? The trade can go back to focusing on the size of the crop. Informa came out with their crop size estimates on Friday. The report did not show much of an adjustment from their March report. This was bearish for corn, as many believed more acres had moved from corn to soybeans. In my opinion, the USDA won’t deviate much from their estimate of 96 million corn acres planted. Having spoken with a few seed dealers, corn seeds were tough to get in Q1 and bean seeds were tough to get in Q2; but in the end, those who needed seeds got them. I think most of the production out there stuck with corn, just as their original planting intentions were to do just that. The acreage numbers should support soybeans, as it looks like not as many wheat producers were able to double crop beans as previously thought. This week’s schedule is light of major grain events, heavy on the macro-market action that grain traders and producers need to keep their eyes on. Europe will be center stage, but the Fed meeting this week will be equally, if not more important. On Tuesday, the US FOMC will be meeting to discuss the economy and the actions they are taking to ensure a healthy financial system. This meeting will be especially important as it it will determine the direction they will take after the end of their recent effort called “Operation Twist”. Operation Twist is, in layman’s terms, a type of refinancing of government debt. Much like when someone refinances their home or business, the borrower is looking to acquire short term cash flow liquidity (what makes things complicated is the fact that the Fed is borrowing money from itself). The Fed kicked the can down the road the last few months and helped the economy’s short term cash flow situation. Yet, it was what the Twist did not do that is far more important. It did not expand their balance sheet or money supply. Their plan was to delay or cancel further easing, as they assumed the economy would continue to improve on its own. The recent economic indicators have not supported that belief, which is why many are calling for much more aggressive action. At this meeting, I believe we will see one of two outcomes. BEARISH — The Fed will stop short of expanding their balance sheet and do another round of refinancing via the Twist. This will kick the can down the road and give the U.S. another short term band aid until the FOMC hopes economy can gain footing and start to rebound on its own. The first scenario should cause a short term price spike across all commodities. The second scenario will be seen as bearish and will not do much to stop this recent slide in commodities prices. Based off their recent statements, I think the Fed will pursue the second option. They will not go the asset purchase route because Bernanke does not want the public or Congress to have the perception that the Fed is the cure to all that ails us. Bernanke has dropped clues to this opinion over the last few months in his statements to Congress directly and indirectly. He has preached “Fiscal Sustainability” and pointed to the financial cliff that is looming at the end of 2012 if action is not taken by lawmakers. The situation on Capitol Hill has been in complete gridlocked. Congress won’t act until they have to. The stare-off that takes place now will only be broken by the distraction — the stock/bond market. When they inflict pain, Congress acts. The lack of reform by our government fiscally has been a side effect of the bailout. I don’t believe the FOMC will come to the aid of the nation’s lawmakers with direct liquidity injection, because such actions only rewards lawmakers for their failure to reform. It weakens the credibility of the central bank and does nothing to solve the problem long term. The fact of the matter is, over the last three years, prices mostly rebounded to near the pre-crash price levels. If the Fed eases in the same fashion as they did in 2012, job growth will come but side effects will come with it. I believe Bernanke knows that and will delay on acting until the economy forces his hand. On the grain front, other than the normal weekly report, a release is due to come out with some new data on livestock supplies and slaughter at the end of the week. We also have July options expiring on Friday for grains. The crop progress report on Monday (June 25th ) should show a continued deterioration of the corn and soybean crops. Most of the corn and soybean belt received substantial rain over the weekend, but I don’t expect the result of those rains to show up on the survey. The trade will probably discount the report because of the much needed moisture Mother Nature delivered over the weekend. From what I have heard, the rains made a huge difference in the crop conditions. Rain makes grain. Producers and traders need to be ready this week for heavy two-way action. I am a buyer of volatility right now. 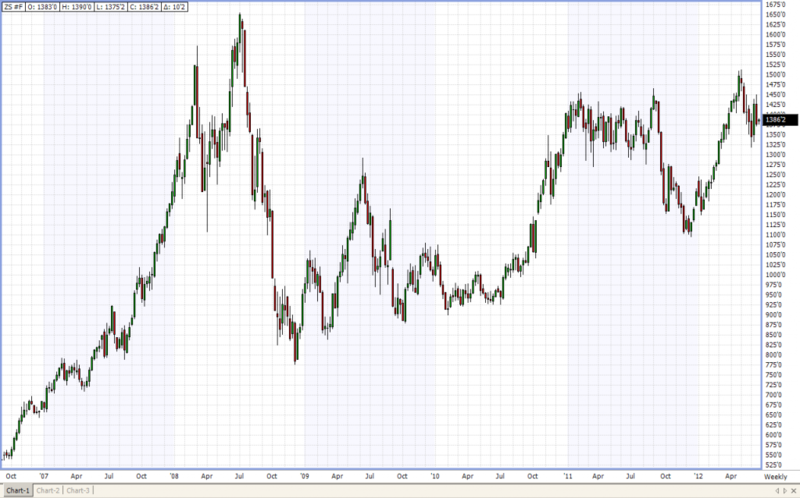 I like buying put spreads under the 2012 soybean and corn crops. I am not always a fan of buying option premiums, but I feel the costs are warranted right now because if the Fed would act, the ability to profit from prices going higher is paramount. If you sell futures or make cash sales, you need to watch for two bullish cards, QE3 and a weather event. If row crop prices rally, you can bet your last donut that input prices will be going up with them. You need to be able to capture the revenue these rallies will bring. Check out the TWIGONOMETRY section below, we have a video that explains a way to do just that. Corn: Front month corn futures traded higher Sunday night after the Greek elections, but lacked any follow through buying to push prices back near the technically important 6.00 level. Last week we saw a big rally in the old-new corn spread, but almost all gains were given back on Friday. The July options go off the board this week. Open interest contracted once again, bringing the total fund participation down to new lows for the year. For the week, I am looking to sell any rallies near 6.00 in old crop corn and buy dips below 5.40 in the front month. With the corn harvest just around the corner, many end users are operating on fumes until the new crop corn comes on line. We have heard of some basis setbacks recently with ethanol plants stopping purchases until the cheaper corn becomes available. If you are sitting on a lot of old crop corn, getting rid of it should be crossing your mind. Basis levels usually hold firm throughout the summer, but with the early plantings in the South getting ready to be harvested in July, things may break sooner rather than later on the cash front. Soybeans: For the week soybeans saw selling pressure back into the lower part of its channel. Open interest was lower, but not substantially. I tend to lean a little more bullish, as crush margins are getting better by the week. Informa did not adjust the acreage like I thought they would, and I imagine the USDA will not either. Seasonally, there are some strong bull patterns entering the picture. I recommend taking a look at bull spreads to take advantage of a tight carryout for the next six weeks. Soybeans were not beneficiaries of early plantings and do not have the huge acreage numbers hanging over the trade. Producers should wait to sell rallies in new and old crop. 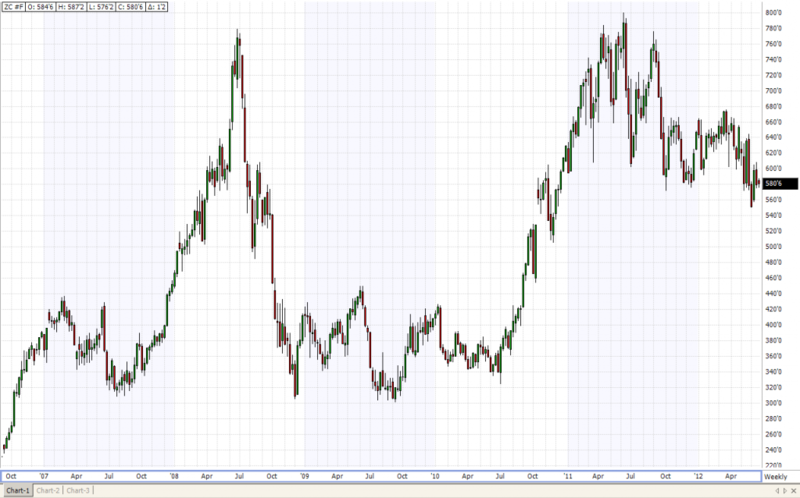 Wheat: The wheat trade has been a bit muddled as of late, grinding above its seasonal lows but well off its highs. 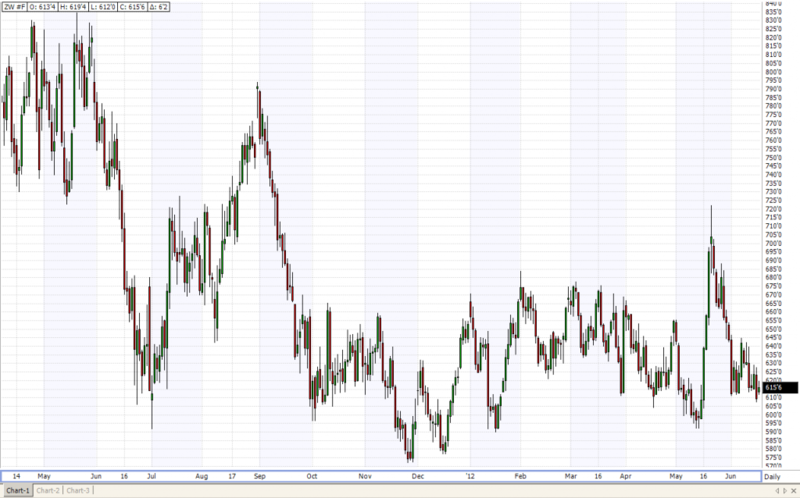 If there is a market worth taking a look at over the next few months, I think wheat may be the trade. Because prices have been low relative to production costs over the last year, many feel the trade will not be looking to produce as much wheat in the coming seasons. I like buying December wheat against December corn, along with buying December wheat against July 13 wheat. These are both good ways to get long. Wheat is still the whipping post by the funds, as they are net short against corn and beans, but when/if that changes, those on the long side will be rewarded. Bull Call Spreads I have been asked by a few producers recently if they should look to make cash sales on their December corn crop. If you have not made any sales on new crop corn, you need to think about doing so ASAP. I have encouraged producers I work with to stagger crop sales throughout the last 6 months. By now I would hope you have at least 50% sold, if not more. Obviously, we all want to sell at higher prices, but with Dec corn still over the cost of production, producers need to think about sustainability and profitability. If you are hesitant to make cash sales here, I think employing a re-ownership strategy would be a good way to overcome some of this remorse. Below is a link to a blog article and a video that explain how to profit from a strategy like this. As always, please call with any questions.